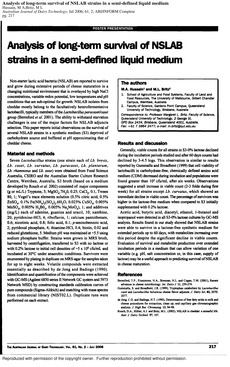 Non-starter lactic acid bacteria (NSLAB) are reported to survive and grow during extensive periods of cheese maturation in a changing nutritional environment that is overlayed by high NaCI concentrations, variable redox potential, low temperatures and pH conditions that are sub-optimal for growth. NSLAB isolates from cheddar mostly belong to the facultatively heterofermentative lactobacilli, typically members of the Lactobacillus paracaseilcasei group (Beresford et al. 200 I). The ability to withstand starvation challenges is one of the major factors for NSLAB adjuncts selection. This paper reports initial observations on the survival of several NSLAB strains in a synthetic medium (S3) deprived of carbohydrate source and buffered at pH approximating that of cheddar cheese.